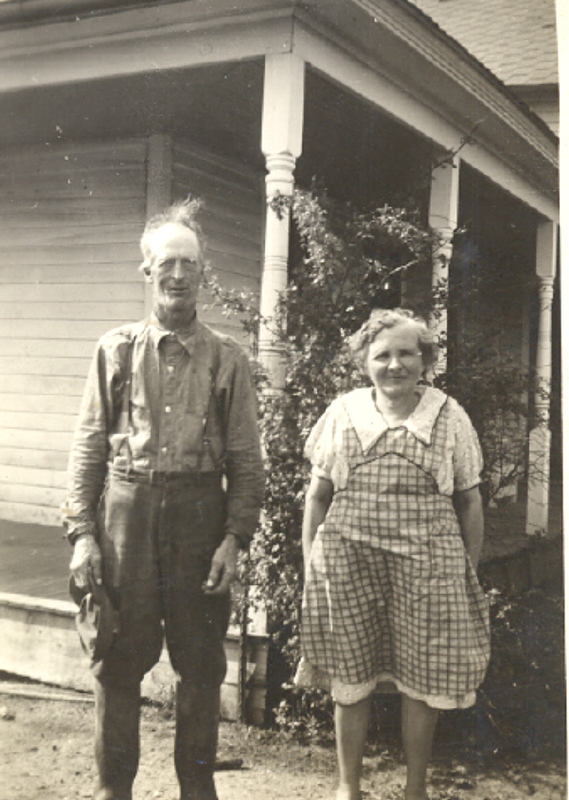 My grandma Snyder, my father’s mother, was 4’2″ tall, humpbacked from scoliosis of the spine, not from falling off a tightrope, as she often whispered when asked by one of us grandkids. Not that she couldn’t have, for according to family historians, which really mean family gossips, her relatives were Hammond Circus trapeze artists who died in an Indiana train wreck in 1918. I would try this genetic disposition out more than once by attempting to walk barefoot up the steel cable that braced the grandparents’ yard light, traversing the cable lengthwise through my instep and grasping it with my toes, but it never failed that after a few feet or so, I either fell or froze such, weaving back and forth, that I had to be helped down. Grandma was very soft-spoken, so soft-spoken that we grandchildren had to be quiet to listen to her. The radio was seldom on, and of course there was no television. In her house, on a sofa in the living room, we grandchildren played games–button-button, the most popular. But outlandish noise, no. All had to be done with respect to silence and the unsaid. Grandma’s other version was that a horse kicked her. That also could have been true, but I doubt it, considering my father’s propensity to tell tall tales, something that he surely inherited from his father and that was probably shared by his mother. Then, true stories were banded back and forth between adults, if they were aired at all. We grandchildren had to listen behind closed doors, but if caught, from then on, we could only hear the sounds of barnyard animals snorting for position and nudging open waterers and feeders. Grandma’s presence was one that inspired awe. We grandchildren measured the depth of our maturity by our height in comparison to hers. Her words golden, but she could wedge kindling in the fire pit of the kitchen’s wood stove and not be burned. When she hooked the cast iron lever into the lid, she did not grasp the lever with a potholder. Sometimes she did first grab the end of her apron if the stove was really hot, but that too would amaze me, for the cast iron stove contained all that fire. While flames spurted out from the firebox, Grandma would wedge in a piece of kindling without singing her hands. Grandma made all her aprons from a special pattern that conformed to the hump in her back. After my mother’s death, in one of her boxes, I found the pattern cut out from old newspaper, laid inside a few yards of flowered material ready to be cut anew. I don’t know where the pattern is now. The kindling was kept in a steel bushel basket over by the sink, replenished often, especially in the late forenoon and late afternoon. The farmstead contained numerous trees, enough for us kids to gather dried sticks and twigs to get the stink out of us, as my father would say. 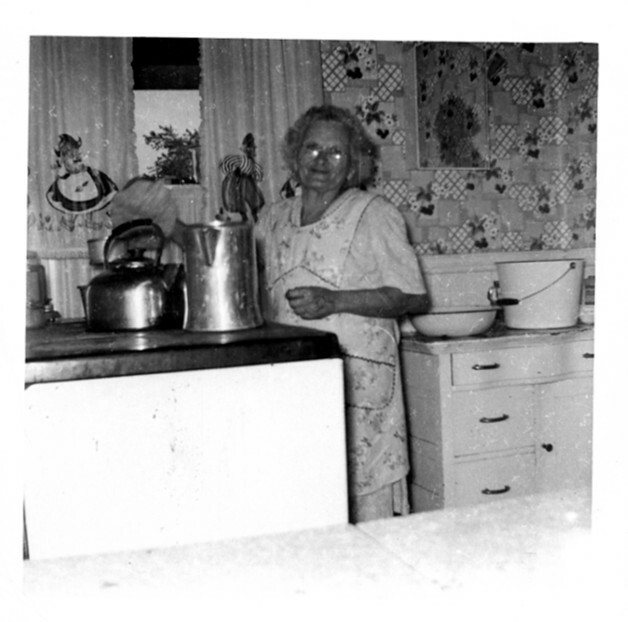 I only remember a few times when I was told to stoke the fire in the wood cook stove, for most of the time, Grandma seldom left the kitchen fire unattended. In that tight kitchen a small table with an enamel top was positioned right beside the door that led into the living room. There Grandpa would pull out a chair and sit and drink coffee, eat lunch and dinner, the space so tight that none could scoot behind his chair into the other room. At that table after stirring in teaspoon after teaspoon of sugar into a cup of coffee, Grandpa would then pour some of the contents into a saucer, and drink the concoction from that saucer. During strawberry season, I was always amazed at the spoonfuls of sugar Grandpa would spread across the mound of strawberries and cream. In the kitchen, to bide my time while Grandma worked in the kitchen, Grandma would set up a small table for me to play canasta, most of the time by myself, or she would reach over and move a card once in a while or tell me what card to play. For years, I thought I would never forget how to play that game, but even though I still see the stacks of cards, the steps have dwindled from my memory. On the other side of the sink, to the left of the door that led into the dining room was a pantry, with its sacks of flour and sugar, canned goods retrieved from the cellar, beans sealed in jars, and other grocery items. The colors in that pantry those of an autumn garden. The entrance only a curtain that moved in accordance with what breeze strode in behind whoever entered. On warm days especially to balance the intense heat of the kitchen, Grandma would open the tiny west window in the pantry, and the curtain would flutter constantly. I remember one time Grandma told me to hide in the pantry. I remember crouching in a corner to the right of the opening. I remember fearing something, but not sure what. When I was a sophomore in the middle of winter, after I worked for the Hueys, the neighbors across the road from Grandma, I worked for one of their friends, a family who lived on a farm close to Irwin. My pay was to be ten dollars a week. During that week, I caught the bus from their house to school. My job was to help the man’s wife in the kitchen and to tend to the children, but first in the morning to make sure the fire in the stove was enough to heat the house. I believe I slept with one of the children, but I do know that where I slept was upstairs in a room in the far corner. I don’t remember what the wife looked like, but the man looked and acted like Glen Huey, a short stubby man that for some reason I felt had a mean streak. One cold morning, the fire mere embers, after I stoked the fire in the pot-belly stove that stood in the middle of the living room, the man of the house seemed to sneak up next to me and say that I would make a good wife for I knew how to build a fire. I don’t know what my father heard or his reasoning, or if my mother urged him, but I do know that without warning, at the end of one week, my father drove up to get me, insisting before I left that the man pay me the ten dollars that I was owed. I know I never told anyone, much less my father, what the man had said to me.